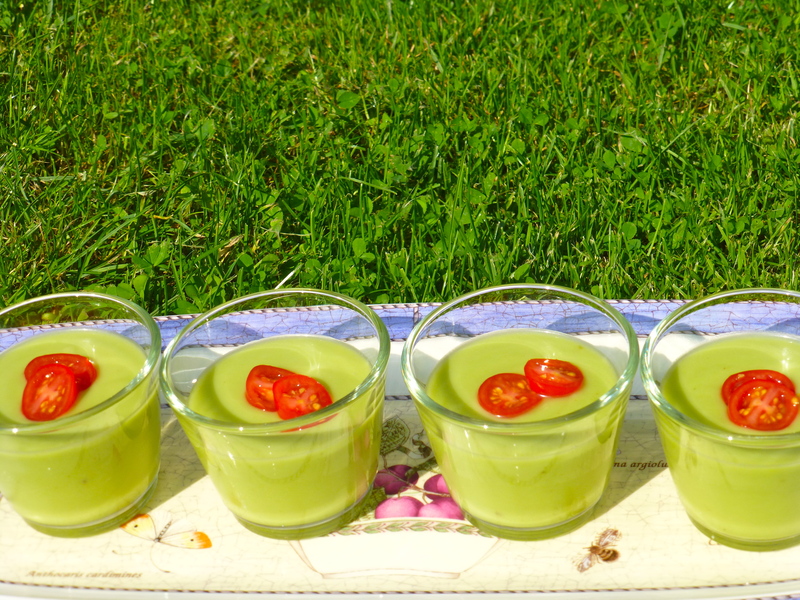 Looking for a cool and refreshing summer soup? Then look no further. This velvety smooth and chilled soup is the perfect summer starter. It’s very easy and quick to prepare and allows you to store in the refrigerator up to 3 days. Cut the avocados in half lengthways and twist to separate into two. Remove the stone and with a spoon, scoop out all the flesh of the avocado. Place the avocado flesh , chicken or vegetable stock, crushed garlic, grapefruit juice and yoghurt into the blender or food processor. Purée until smooth, taste and season with salt, black pepper and mild chilli powder. Refrigerator for a minimum of two hours. Serve chilled and with a colorful garnish on top. The first time I ate this delicious soup was over 25 years ago. At the time my mom made this soup it was a very exotic dish. 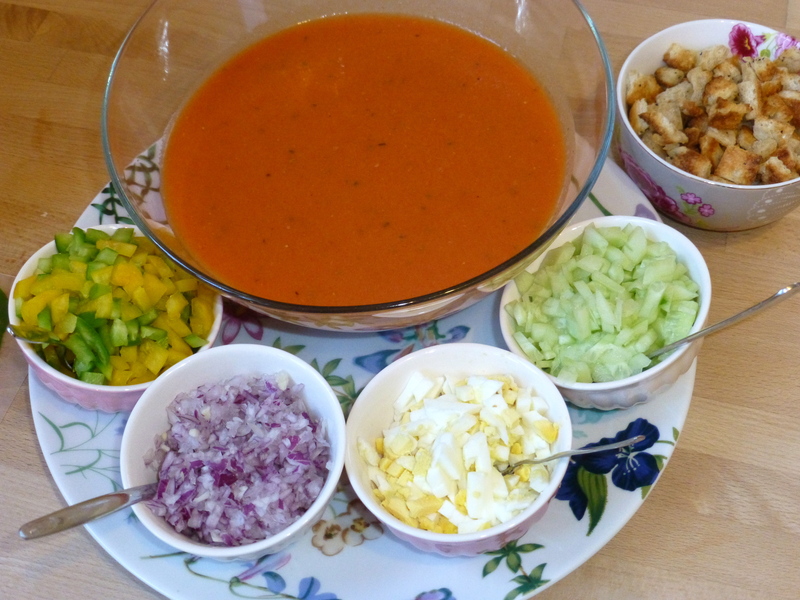 Growing up in a family where all my ancestors originate from a different country our meals were not typically Dutch, but still this Gazpacho was something else! A soup which we ate cold and then garnished with all sorts of different toppings ourselves was special and very festive. The recipe of the soup is very simple, and to me it is perfect just the way it is. Please, choose ripe and flavourful tomatoes which are warmed to room temperature before you use them. The dicing of the garnish does require some time. If you’re a bit short on time, I would say go for the home-baked croutons (I promise you: after trying these you will never want them any other way) and garnish the gazpacho with some fresh basil. This amount of tomatoes yields 1.5L of soup or in my case after tasting 1.25L…. I hope you will enjoy this recipe as much as we do. Wash the tomatoes thoroughly. Cut a shallow X on the bottom of the tomato. Prepare a bowl of ice water and set aside. Drop the tomatoes into the boiling water and immediately remove it once the skin starts to peel, approx. 30 seconds. Place the tomatoes in the bowl of ice water and leave it there for a few minutes. Once the tomatoes have cooled off, you will be able to peel off the skin very easily. Purée all the peeled tomatoes with a hand blender or regular blender. Pass the tomato purée through a sieve or a strainer to remove all the seeds. Stir in the tablespoon of olive oil, juice of the lime, the teaspoons of ground paprika and honey. Add the purée of the 3 cloves of garlic by using a garlic press or chop very fine with a knife. Season with sea salt, coarsely ground pepper and the leaves of the thyme. Chill in the fridge for a least three hours or even better, chill overnight. Please, don’t chill the soup with ice cubes as it will dilute the beautiful flavour. To make the garnish, finely dice the onion, red pepper, yellow pepper, green pepper, cucumber and hard-boiled egg. For the croutons, preheat your oven to 375 F or 190 C degrees. Cut the slices of bread into 1 cm (½ inch) cubes. Drizzle bread cubes with olive oil, sea salt and coarsely ground black pepper and toss until well mixed. Spread the bread cubes in a singly layer on a baking sheet and bake until golden brown. Keep your eye on them, to make sure they don’t burn, and turn to brown all sides evenly. Once golden brown, remove from the oven and let them cool. I like to serve the gazpacho without the garnish. Instead, I place all the different kinds of garnish on the table and let everybody make their own creation.